I guess we should get all the long-title references out of the way. 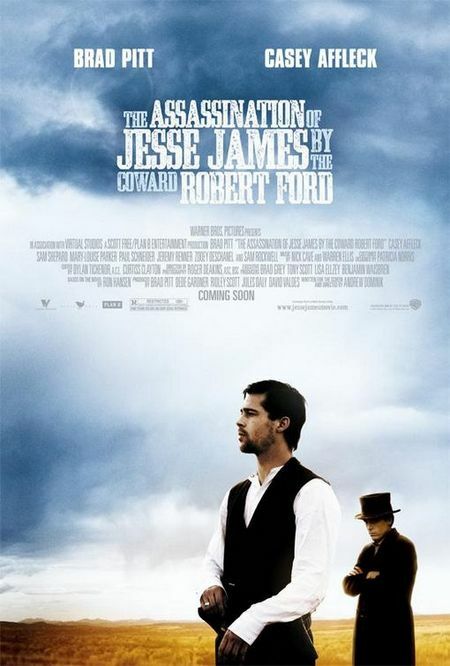 I will begin by stating that from here on out, The Assassination of Jesse James by the Coward Robert Ford will simply be referred to as Jesse James. It’s not as if The Movie Mind needs any further excuses to be long-winded. Certainly, a three-line title would stretch this review onto a new server. If you didn’t know going into this film that it was adapted from a novel, you certainly knew coming out of it. While this is as close to reading a book that The Movie Mind wants to get when watching a movie, I can still say it is one of the more intriguing and gripping novel/movies I have seen in some time. While it can be too pretentious for my taste to talk about the “look and feel of a movie”, some general movie-snobisms that movie criti-quacks use, I have to be honest and say this had about as authentic a look and feel for a western as I’ve ever seen. I think you will be in for a treat when you sit down for this one. Let’s make sure of a few things first though. It can be said that a person’s demeanor and expectations going into a film can dictate his or her reactions to it as much as the film itself. Whatever that means, allow me to properly set your expectations going into this movie. First of all, make sure you have some serious time on your hands. I’m not talking, like, you’ve got two solid hours to kill so you can dedicate your whole self to watching this film. I’m talking making sure you have the better part of a whole day to sit for this thing. In all seriousness though, we’re talking somewhere nearing three-full hours for the film. As you all know The Movie Mind feels strongly that if a story cannot be told on the big-screen in less than two hours, something is wrong with the storytelling. Well, I still feel that way. To be fair though, it did not feel nearly as long as it actually was, and that usually means a lot. The other expectation you must have is that this is not your typical shoot-em up Wild-West flick. 3:10 to Yuma was one that foots that bill, albeit as one of the best in that category. Jesse James is true-and-through a character driven film. That is not to sound like a bad thing, but it is something to prepare for, especially if you thought this was going to be The Outlaw Jesse James running around and shooting everything that crosses his path. Instead, the movie focuses on an aging outlaw who is struggling with the paths of his life and all those he encountered along the way. This is a perfect tale of what it was like, when the gunmen who ruled the Wild West got old. This is what happened when the outlaws of that era realized that they no longer could count on anybody, and indeed needed to fear everyone who crossed their paths. We follow the tale of the disbanding of the James Gang who robbed and terrorized many trains, citizens, lawmen, and anyone who got in the way of what they set out to get. We are introduced to the toll this has taken on the James clan in the start of the movie when Jesse’s brother, Frank, decides to leave him after many reckless crimes. His fear of what Jesse is capable of presents us with a stark reality to what those who were closest to him really and truly felt about him. Brad Pitt truly does an amazing job of portraying James, who some say is one of the toughest old west outlaws to get a handle on. Pitt does exactly that, by varying his emotions constantly so as to keep the audience confused as to what kind of man he really was. After all, how does a man who terrorized every community he was a part of become so revered by those exact citizens who inhabit it? I’m sure most of it had to do with the fact that James truly was a living legend some described as Robin Hood. It would not be a stretch to say this has been some of Pitt’s best work of his career. On the other side of this enigmatic creature is one of those citizens who grew up idolizing this living legend. Casey Affleck plays the coward himself, Robert Ford. We as an audience may have even felt sorry for this character if it weren’t so plainly spelled out in the title that it would not be tolerated. Ford is a young kid who has been bullied by all around him for his entire life. He is so desperate to make a name for himself, and he plans on doing it alongside the man he has an unhealthy obsession with in Jesse James. Since the ending is a foregone conclusion, I am a little miffed that it took us almost three hours to get to a point the title already spelled out. It would be like if The Usual Suspects was titled: [Do NOT read this if you haven’t seen it…actually if you haven’t seen The Usual Suspects just get the hell off this website] “Keyser Soze is Verbal Kint”. I still feel like I saw a truly excellent movie. Jesse James truly was an in-depth look at the minds and lives of these two characters who achieved fame for very different reasons. Since we all know how the movie ends, it is more a focus on the journey of how we end up there. And don’t think there isn’t some mystery maintained as I am still shocked and confused as to how and why the “act” was committed in the way it was. So keep pumping out these classic westerns that we will be able to enjoy for years to come. Just make sure you have plenty of time to spare. Robert Ford: Let me be your sidekick tonight. Robert Ford: So you can examine my grit and intelligence. Frank James: I don’t know what it is about you, but the more you talk, the more you give me the willies. Now I don’t believe I want you anywhere within earshot this evening, okay? You understand? Jesse James: You think you do, but you don’t. Jesse James: Look at my red hands and my mean face… and I wonder ’bout that man that’s gone so wrong. Jesse James: I’ll tell you one thing that’s certain; you won’t fight dying once you’ve peeked over to the other side; you’ll no more want to go back to your body than you’d want to spoon up your own puke. Jesse James: You know I’m real comfortable with your brother. Hell, he’s ugly as sin and he smells like a skunk and he’s so ignorant he couldn’t drive nails in the snow, but he’s sort of easy to be around. I can’t say the same for you, Bob. Jesse James: My God, what just happened? I could hear your gears grinding- rrr,rrr,rrr-and your little motor wondering, ‘My Gosh, what’s next, what’s happening to me?’ You were precious to behold, Bob. You were white as spit in a cotton field! Governor Crittenden: Jesse James is nothing more than a public outlaw who’s made his reputation by stealing whatever he could and by killing whoever got in his way. You’ll hear some fools say he’s getting back at Republicans and Union men for wrongs his family suffered during the war, but his victims have scarcely ever been selected with reference to their political views. I’m saying his sins will soon find him out. I’m saying his cup of iniquity is full. I’m saying Jesse James is a desperate case and may require a desperate remedy. Jesse James: Yeah, just ain’t no peace with old Jesse around. You ought to pity my poor wife. Robert Ford: I can’t believe I woke up this morning wondering if my Daddy would loan me his overcoat, and here it is just past midnight and I’ve already robbed a railroad train and I’m sitting in a rocking chair chatting with none other than Jesse James. Sounds good and I want to see it, but 3 hours in a theater??? I think I’ll wait for DVD……..but you do have me thinking about the early show on Sunday! It’s already on PPV, so don’t stress it.